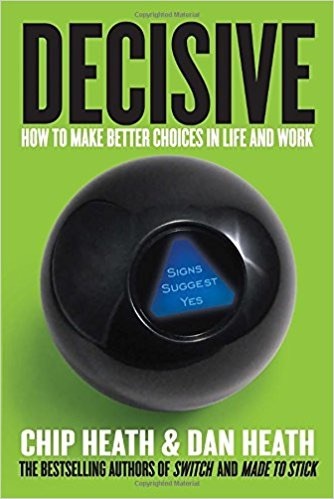 Decisive: How to Make Better Choices in Life and Work by Chip & Dan Heath shares research and cool stories that show how our decisions are disrupted by an array of biases and irrationalities. They go on to introduce a four-step process designed to counteract these problems. Their fresh strategies and practical tools will enable you to make better choices at work and beyond. If you want to increase your chances of making the right decision at the right moment, this book is for you. Click the icon at the bottom of any page to buy this important book for yourself and your key colleagues. Chip Heath is a professor at the Graduate School of Business at Stanford University. Dan Heath is a senior fellow at Duke University’s Center for the Advancement of Social Entrepreneurship (CASE). They are the authors of the bestsellers Switch and Made to Stick. While working on this book, the authors asked that I forego my usually summary approach and do a more traditional book review highlighting a few useful concepts and to use my educational expertise to show readers how to apply them to their life. I have tried to honor this request and thank them for their input. Chip and Dan start with the key core difficulties that negatively impact our decision making. We think we know everything there is to know prior to making a decision. We also tend to be overconfident in our knowledge of the future and seek only data that confirms what we believe. We let our emotions get in the way, and often present choices in either/or terms. Doug: In education, I’ve seen each of these whenever decisions were made whether by myself as principal or by a collaborative process. It is important to challenge your own thinking and say things like “you may have a point” when a colleague disagrees. Everyone knows that they aren’t always right, but it’s hard for many people to investigate the possibility that they are wrong prior to committing to a decision. They are more likely to dig in and defend their position. Ask: What Else We Could Do/Buy? When dealing with budget issues, you should always ask “what else could we buy” if we didn’t buy the item(s) we are considering? A good example today is what could we buy with all the money we are spending on textbooks and standardized testing? The vanishing options test would also allow you to consider what to do with an administrative position when someone leaves. Always ask “how else you could accomplish the person’s function, and is there some part of what they are doing that doesn’t need to be done.” I have found that for administrators, the job will expand to fill the day with tasks that aren’t mission critical. This entry was posted on Thursday, March 28th, 2013 at 7:59 am	and is filed under Book Summaries, Business Books, Education Books, Leadership Books. You can follow any responses to this entry through the RSS 2.0 feed. You can leave a response, or trackback from your own site.